Dr. Gadaleta is Associate Chair, Chief of General Surgery, MBS Director, North Shore University Hospital, Northwell Health, Manhasset, New York. Dr. Petrick is Quality Director, Geisinger Surgical Institute; Director of Bariatric and Foregut Surgery, Geisinger Health System, Danville, Pennsylvania. 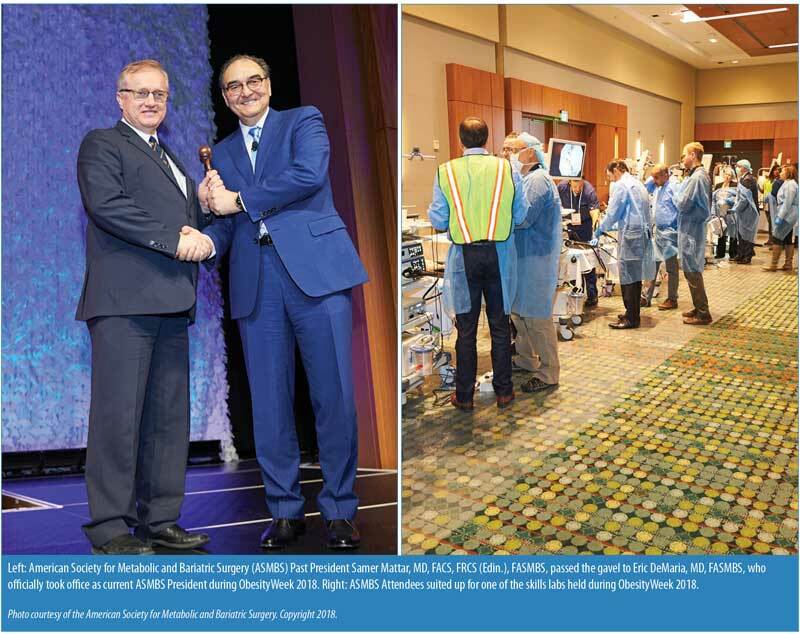 The 35th annual meeting of the American Society for Metabolic and Bariatric Surgery (ASMBS) was held at ObesityWeek 2018 for the first time in Nashville, Tennessee, this year . This unique, international event focuses on the basic science, clinical application, surgical intervention, and prevention of obesity. The ASMBS and The Obesity Society (TOS) again joined resources and presented an outstanding scientific and educational conference covering cutting-edge basic science, clinical research, and public policy impacting the quality of life for the millions who suffer from obesity. The ASMBS Integrated Health Keynote Address was given by Randy Seeley, PhD, the Henry K. Ransom Endowed Professor of Surgery at the University of Michigan School of Medicine, and the Director of the National Institutes of Health (NIH)-funded Michigan Nutrition Obesity Research Center (MNORC). This address was followed by the ASMBS Integrated Health Presidential Address, which was provided by Karen Flanders, MSN, APRN, CBN. Both speakers and presentations were well-attended and well-received. This year’s ASMBS Mason Lecture was given by Harvey J. Sugerman, MD, Emeritus Professor of Surgery, Virginia Commonwealth University. Dr. Sugerman described the mental and physical struggles that helped define him as he worked his way through medical school at Thomas Jefferson University, his residency training as a Lieutenant Colonel time in the United States Army, his time as a practitioner in private practice, and ultimately his 28 years at the Medical College of Virginia, which culminated in his becoming the David Hume Professor of Surgery, Chairman of the General and Trauma Surgery Division and Interim Chair of the Department of Surgery. This courageous and heartfelt address will likely have a lasting impact on all who attended. ASMBS Past President Samer Mattar, MD, FACS, FRCS (Edin. ), FASMBS, passed the gavel to Eric DeMaria, MD, FASMBS, who officially took office as current President of the ASMBS. Both addressed the audience, highlighting the past year’s accomplishments as well as initiatives for 2019. Next year’s ObesityWeek will focus on the obesity-related comorbidity type 2 diabetes mellitus (T2DM), and Dr. DeMaria shared that he is planning for a term that aligns with that theme. This year, the ASMBS had 18 preconference courses on Sunday and Monday for all attendees, providing sessions for both novice and seasoned members. These full- and half-day courses were designed to improve skills, help begin a new program or take an existing program to the next level. The course on the high-risk patient, directed by Keith Kim, MD, and Vinni Bajwa, MD, had presentations on the evaluation and safe surgical management of patients with severe and end-stage cardiac, renal, and hepatic disease before and after transplant, as well as patients with severe immune deficiency or hypercoagulable state. The afternoon focused on the surgically complex patient, and presenters provided insight and strategies to manage patients with severe reflux, prior foregut or trauma surgery, and complicated abdominal wall hernias. The enhanced recovery after surgery (ERAS) course, directed by Scott Monte, PharmD, featured presentations by Anthony Petrick, MD; Stacy Brethauer, MD; and Brandon Williams, MD, among others. The half-day course was an excellent review of best practice, and it served as guide to anyone considering incorporating ERAS into their surgical program. This article highlights just a small sample of the outstanding posters, videos, and papers presented at the meeting this year. ObesityWeek also offered numerous social and networking opportunities. 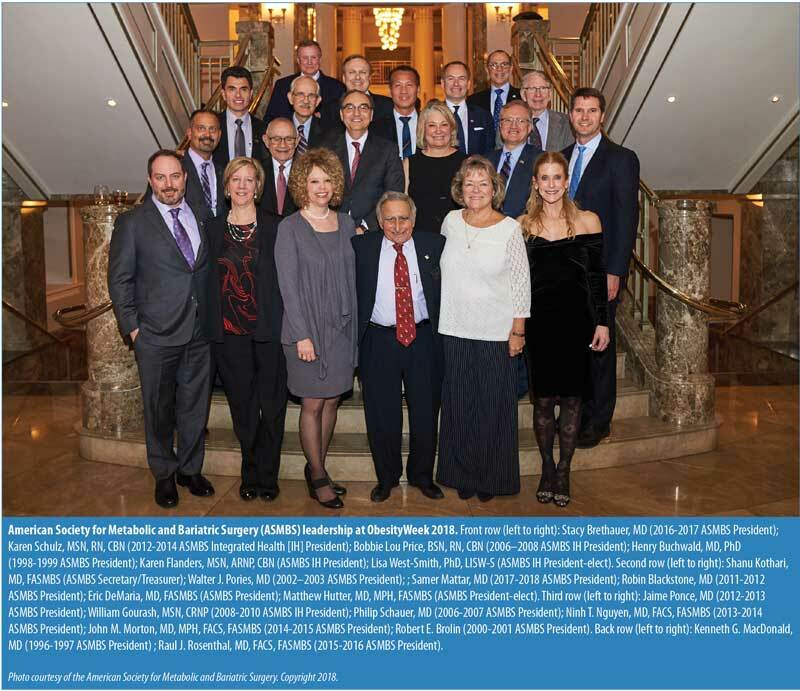 Congratulations to the Program Committee for organizing an outstanding event and to the ASMBS Foundation for another successful LEAD Awards ceremony. Planning is underway for next year’s annual meeting, which will be held at ObesityWeek 2019 in Las Vegas, Nevada, November 3–7, 2019. 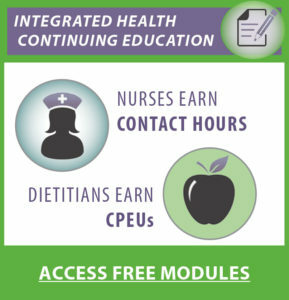 Next month: Decreasing Readmissions through Opportunities Provided (D.R.O.P. ), the first national Metabolic and Bariatric Surgery Accreditation and Quality Improvement Program (MBSAQIP) quality improvement project. Aleassa EM, Khorgami Z, Tu C, et al. Bariatric surgery decreases mortality of congestive heart failure: A nationwide study. Surg Obes Relat Dis. 2018;14(Suppl 11):S4. Biertho L, Nadeau M, Pelletier M, et al. Metabolic surgery versus best medical management for type 2 diabetes: Interim analysis of the REMISSION prospective controlled trial. Surg Obes Relat Dis. 2018;14(Suppl 11):S6. Brethauer SA, Petrick A, Grieco A, et al. 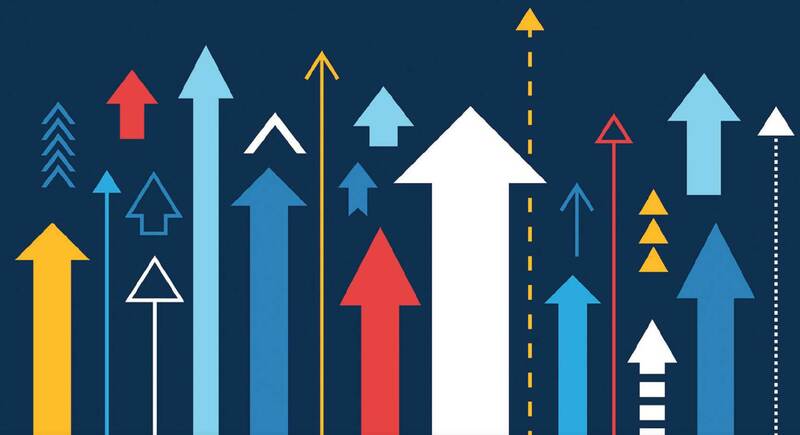 Employing new enhanced recovery goals for bariatric surgery (ENERGY): A metabolic and bariatric surgery accreditation and quality improvement (MBSAQIP) national quality improvement project. Surg Obes Relat Dis. 2018;14(Suppl 11):S6.